Remember the classic-beloved book-“The Secret Garden written by Frances Hodgson Burnett published in 1911”? Let me refresh your memory and give you a brief background of the book-The Secret Garden, before I talk about the book-“The Forgotten Room.” In the Secret Garden, there was the main character-Mary. At first Mary was a selfish, arrogant, mean, non-caring girl, who lost both of her parents and then was sent to live with her uncle. Slowly, the character of Mary transforms into a caring and loving girl. Mary develops friendships with Colin and Dickon, who have many adventures in a magical, Secret Garden. The Secret Garden shapes the characters of Mary and her cousin-Colin to the better. Colin loves the Secret Garden just as much as Mary. The Secret Garden gives Colin a reason to build up his strength and the will to live. Colin becomes stronger each day-where he is walking and running and one day, his father walks into the beautiful Secret Garden and his son Colin walks up to greet him. 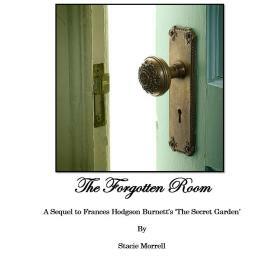 The Forgotten Room is the sequel to the book-The Secret Garden. This book is written by a different author-(Stacie Morrell) but Stacie writes in the same type of style as Frances Hodgson Burnett-(author) of the Secret Garden-that you would have thought that the Forgotten Room was written by France Hodgson Burnettt. Stacie Morrell writes a fantastic book. This book has the same beloved characters of Mary, Colin, Dickon, Mary’s uncle, Martha and the other servants of Misselthwaite Manor and also has a few new characters added into the book. Mary and Colin get a governess..whom becomes much more than just a teacher but also as a mother figure to both Mary and Colin. Mary and Colin learn many new things from their new governess. Mary and Colin become close,the uncle’s sprit lightens and laughter, joy and love fills Misselthwaite Manor! Mary, Colin and Dickon have new adventures in this book. The Secret Garden continues to be a cherished place for Mary, Colin and Dickon to go to. Mary and Colin share The Secret Garden with their new governess and Mary’s uncle will occasionally come into the Secret Garden. In the Forgotten Room, Mary discovers a new secret place, which she treasures, finds happiness, comfort and becomes her own special place! I like how the author takes the time to develop each character more fully and focuses in on family, friendship, love and responsibility. The longing for a mother figure enters both Colin’s and Mary’s mind. Do Mary and Colin-get a mother? One will just have to read and find out! Colin and Mary are not only cousins, but also close friends who care about each other deeply. You see the friendship of Mary and Dickon develop into a deeper friendship and then hints towards the end that the friendship might have a tinge of romance added? Mary’s relationship with her uncle deepens as does Colin’s relationship with his father. The reader gets a sense of how much Colin’s father and Mary’s uncle love each of the two children. Mary and Colin develop a sense of responsibility and maturity with learning with their new governess. This book is a great and enjoyable read! The Forgotten Room is a book that would be a book that children and adults can read together. There are many different themes and values in the book that the parent and child can discuss. This book teaches kids values of love, caring for another, importance of family, responsibility and friendship! Adults too will cherish this book. The book will bring the adult reader back to the magic of childhood! How does the character of Mary change in this book? How does the character of the uncle change in the forgotten room? How does the new governess shape the characters of Mary and Colin for the better? How is The Forgotten Room similar to the Secret Garden? How are the two books different? Does the relationship between Colin and Mary change at all? What is Mary’s secret place and why is it cherished by her? How do you see the value for love for another in the Forgotten Room? ---------------------------------------------- Advanced Writers Book Review Writing Service with ENL experts. My Paper Writer - paper writing service. Choose E Writing Service if you struggle with your papers. Online Assignment Help from experts for all the busy students.